In the second half of the nineteenth century the pollution of urban centres made the divide between town and country startlingly clear to many. Bringing a little of the country and suburbs to the inner city, however, were the Flower Missions, voluntary organisations that distributed flowers to the sick and poverty-stricken with messages of hope and comfort. 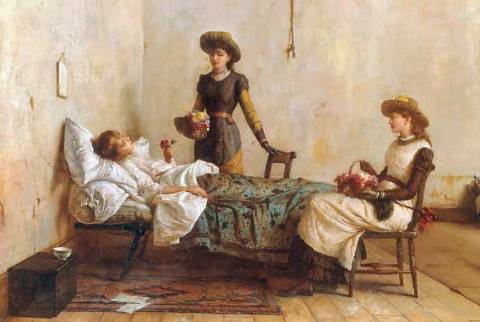 Flower missions – the donation, arrangement, and distribution of fresh flowers to the sick and needy – were said to have originated in the US in the late 1860s when a young lady, touched by the delight that her simple gift of flowers excited amongst some children, recruited others to make the gift a regular and more widespread one. In Britain, the first flower mission was instituted in Hull after a letter was published in local newspapers requesting violets, primroses, and other spring flowers. Several flower missions were set up in a similar way across Britain throughout the 1870s. The scale of some of these operations can be glimpsed in an annual report of the Manchester Bible Flower Mission, founded in 1876. 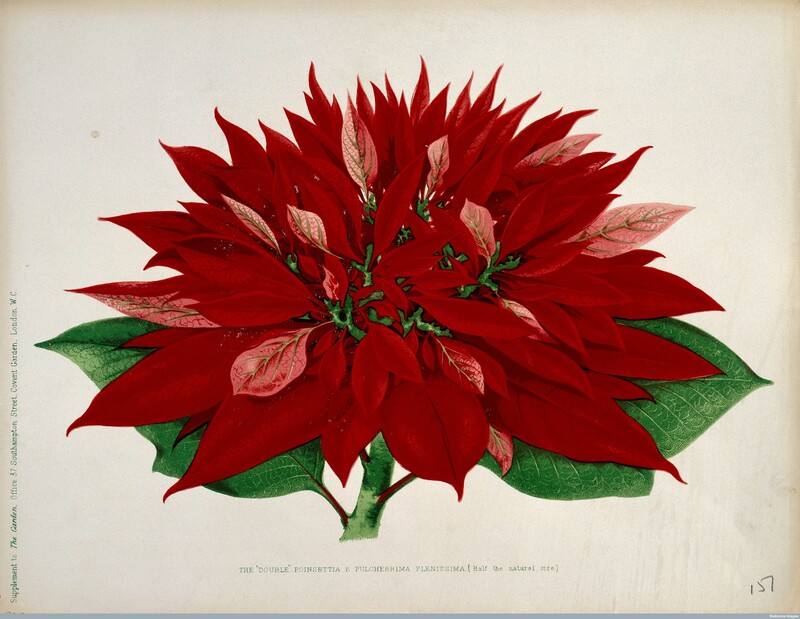 In its first year it managed to distribute just 22 bouquets of flowers, but in 1877 gave out an astonishing 17,418 gifts. Meeting weekly at the Young Men’s Christian Association, people brought along flowers from their gardens or – if they couldn’t reach the YMCA – took them to one of the Mission’s helpers whose home acted as a suburban receiving station. The day of mission work was a full one, with volunteers gathering in the early morning to make up bunches, then setting out to distribute them in the afternoon. Schoolteachers might involve their children in the collection and delivery of flowers: the George Yard Ragged School in Whitechapel took their flowers to the back streets of the East End where they brightened up many a gloomy terrace house. With ‘floral pursuits’ including gardening and flower-arranging growing in popularity among the middle classes, their incorporation into philanthropic activity was perhaps a natural one. The East End Bible Flower Mission encouraged its members to grow flowers, offering packets of seeds free of charge. The missions also distributed fruit and vegetables or lavender bags; during the winter, arrangements of berries and leaves were constructed. Nothing was wasted: fallen petals were collected up to scent cupboards and drawers, or picked up by children who made “poppet shows” of them, ‘gumming them on to bits of broken glass to form a sort of kaleidoscope’ (don’t try this at home, children). She also noted that the oxygen produced by flowers had a healthful influence (in contrast, hospital flowers in the present day have occasionally become objects of suspicion, suspected of stimulating allergies or transmitting infection). If flowers were ‘mental food’, though, they were also ‘mute messengers’. Naturalist and author Henry David Thoreau described flowers as reminders ‘that a wise purveyor has been [here] before [us]’, and flower missions were keen to spread God’s word. Attached to each bunch of flowers was a card, upon which was written text from the Bible, a short verse, or a proverb. 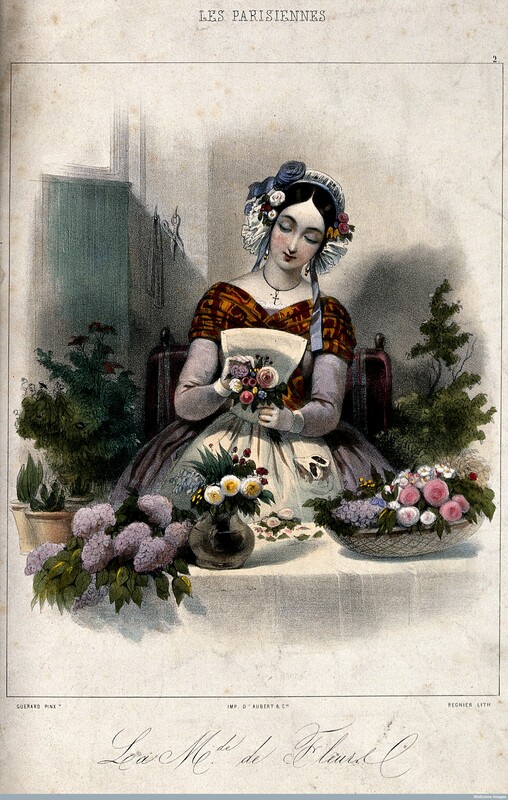 Missions paid careful attention to the content and design of these cards, praising those beautifully decorated with shells or embroidery and lamenting those cards ‘cut in grotesque shapes, and with unsuitable verses’ that were occasionally sent in by volunteers. Well executed cards were often kept (as bookmarks, or hung on walls as a decoration) or passed on to loved ones – one lady sent hers to her son serving as a soldier in India. Apart from biblical instruction, flowers could also offer a more practical education. In the gifts of flowers they received from the countryside, residents of the poorer areas of London glimpsed a different world and – if they were fortunate enough to receive a potted plant – were able to participate in the business of cultivation themselves. Despite the rather miserable assertion of one correspondent to The Spectator that ‘[m]erely to distribute bouquets [was] casting pearls before swine’, missions were quick to highlight the wider benefits that the gift of a plant could bring. A plant given to a sick girl in the slums apparently caused the washing of the windows to give it light and the opening of the windows to give it air, leading to a gradual cleaning and tidying of the whole house. In this way, we can see how the missions could be conceived of as one small part of a broader drive towards better urban sanitation and the provision of green spaces. The missions may, on first sight, seem like a rather frivolous exercise, but they were significant in encouraging people from all walks of life to take an interest in the natural world, as well as their own health and that of their fellow citizens.